Cystic fibrosis is a genetic condition that generally affects children and young adults. It is characterized by production of mucus that’s abnormally thick and can cause severe respiratory infections. 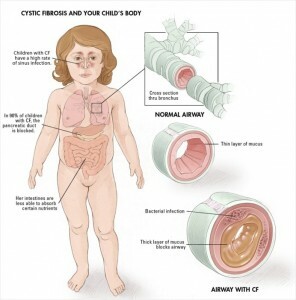 Cystic fibrosis can affect the functioning of the lungs and the digestive system. Chronic infection can lead to progressive lung damage and even result in death. 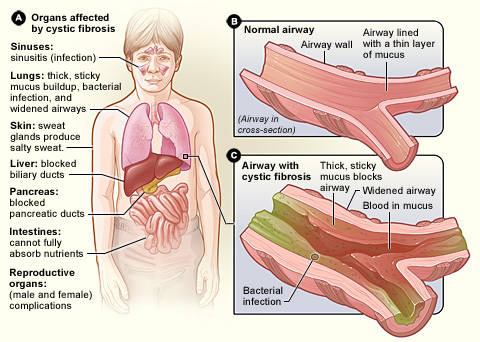 Cystic fibrosis symptoms include frequent instances of sinusitis, bronchitis and buildup of sticky mucus in the respiratory tract. Most children with the condition die as infants only ten years ago but today the cystic fibrosis life expectancy is about 37 years. Some of the commonly used methods of treatment for cystic fibrosis include pancreatic enzyme supplements, multivitamin therapies, inhalation of oral antibiotics or administering them intravenously, mucolytics, bronchodilators and anti inflammatory medications. The latest cystic fibrosis treatment that is regarded by leading specialists as one of the best ways of dealing with the condition is salt therapy. However, salt therapy is not a new development. This form of treatment can be traced back to ancient Greece to the times of the great physician, Hippocrates. He used to treat patients with respiratory problems through salt water steam inhalation. Medieval monks were also known to treat patients by making them inhale salt particles found in salt caves, called speleotherapy or halotherapy. In modern times, salt therapy is being used in different forms. In Europe, salt caves form a key element of treatment of patients suffering from chronic respiratory diseases. The air in salt caves located underground has a high concentration of microscopic salt crystals and ions. When inhaled deeply, the salt crystals present in the air enter deep into the lungs where harmful bacteria and allergens are neutralized resulting in reducing swelling of the lung tissue. It is now possible to enjoy the benefits of salt therapy without having to travel to salt caves. There is an advanced ultrasonic salinizer – SaltAir – available that is designed to produce the same effects as the air of natural salt mines. SaltAir is engineered to convert saline solution into salt micro particles which are then dispensed into the indoor. People suffering from respiratory illnesses inhale the salty air – recommended during the night sleep – which provides relief by penetrating deep into the lungs. It is easy to use as no mask or mouthpiece is used. Ultrasonic salinizer SaltAir can provide long term relief from many breathing problems including respiratory problems caused by cystic fibrosis. Feeling breathlessness due to stuffy nose is a common health problem for some of us. While there are multiple reasons behind this issue, we often get confused about finding the right reason causing this discomfort. Although in reality this breathlessness can happen due to multiple reasons, we mostly apprehend asthma as the universal trigger. As a result we fail to get relief if we try self-medication. The most viable solution for finding the reason behind the problem of shortness of breath is consulting a doctor and to get a thorough medical investigation done. It is commonly observed that some other common reasons exist, which may cause respiratory problems. To be more precise, there are two mechanical processes involved in smooth breathing: one is ventilation and the other is respiration. Problem in any of these two processes may cause breathing problems. Let’s check here what may cause the irregularity. The common similarity between all these triggers is due to some situation the body suffers from increased demand of oxygen or there is short supply of air. Supplemental oxygen may be one of the most effective remedies but sometimes unless the main reason is treated, patients suffering from shortness of breath cannot get complete relief. 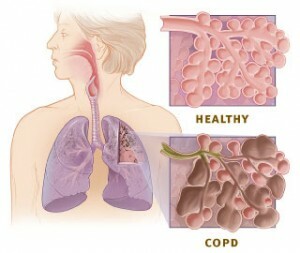 Swelling of the airways, like pneumonia, congestive heart failure (CHF). In both cases immediate medical intervention will restore normalcy. The problem of severe anemia creates lack of blood cells required to carry oxygen. Sometimes lack of oxygen in air may cause acute shortness of breath. For instance, in higher altitude due to thinness in air at time it becomes difficult to get adequate supply of oxygen while breathing. Similarly in a confined space, due to inadequate or no supply of fresh air, causes breathing trouble for people staying in this no-oxygen zone. These are the common reasons for respiratory discomfort. Right medication and medical intervention may ease the discomfort faster.